Thriving in an era characterized by eco-friendliness, Blended Fibers Market in recent years, has emerged as a niche business catering to some of most pivotal verticals. A vital sub-sphere of the polymers and advanced materials space, blended fibers industry today encompasses companies that have been attempting to recreate fibers that would have minimal impact on the environment. A recent instance of the same can be attributed to Lenzing’s product launch. Elaborating further, the Austria-based specialty fiber maker Lenzing recently planned the launch of EcoVero, a viscose fiber that apparently has a very low environmental impact. The new product reportedly will have a 100% supply chain transparency, an ecological production methodology, and will use sustainable wood resources. Given its eco-friendly characteristics, this product is likely to set a new benchmark in blended fibers market in the years ahead. As per estimates in fact, blended fibers industry size was pegged at USD 35 billion in 2016. Given the extensive proliferation of textiles in the apparel and furnishing sectors, blended fibers market has been forecast to chart out a profitable growth path in the years ahead. As environmental safety takes precedence over industrial processes, companies are seen depicting tendencies to recycle and upcycle waste for fabric production, which would have a commendable impact on the future blended fibers market trends. Say for instance, recently, Seaqual – the joint venture formed by three prominent companies, announced its debut fiber sale that was generated by upcycling plastic waste. Apparently, this waste is the one that is collected on oceanic grounds and is then extracted with the help of 400 partner fishing boats. In essence, with every kilogram of fiber that Seaqual produces, a kilogram of waste is eliminated from the sea. The start-up’s novel idea has attracted numerous investors in blended fibers market, given the appreciable contribution this production methodology is likely to have on the environment. Seaqual’s thus-produced yarns can apparently be used as it is or can be blended with natural fibers for swimwear, denims, ready-to-wear, and sportswear. Despite the fact that these fibers exhibit properties similar to polyester fibers, what stands out is that the Seaqual fiber enables energy savings of 50%, lowers carbon emissions by 60%, and reduces water consumption of 40%. These estimates indeed affirm that the Seaqual fiber is a force to reckon with in blended fibers industry. The critically endangered environmental situation of today has prompted companies to adopt the ‘go-green’ trends. In consequence, plant-printed fabrics have once again been gaining prominence in blended fibers market, as are seaweed-derived fabrics. The latter had actually been quite a rage back in the late 1940s, when seaweed fibers were blended to form rayon. As on today though, technology has made it possible to achieve the breakdown of these cellulose fibers, blend them with other plant fibers, and then eventually weave them into cloth. 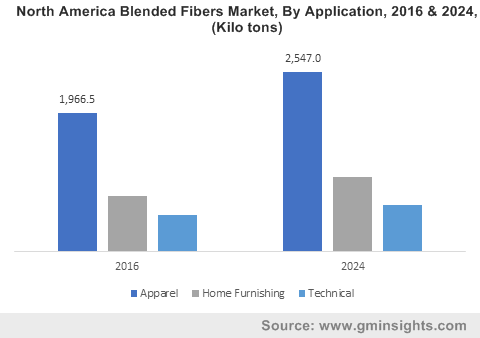 With research activities unearthing age-old, conventional as well as newer innovations in fiber technology, blended fibers market outlook is likely to witness a dynamic transformation in the years ahead. Furthermore, the trend of bringing forth the environment-friendly factor in textile production is also likely to generate a plethora of opportunities for companies, which would substantially strengthen the competitive landscape of blended fibers industry.